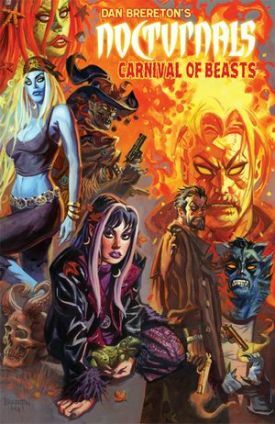 Nocturnals was a six-issue comic book series created by artist Dan Brereton and published in 1994-1995 under defunct-publisher Malibu Comics’ Bravura imprint. Those six issues were collectively subtitled “Black Planet,” and later became a trade paperback from Oni Press in 1998. Nocturnals focused on the supernatural exploits of Doc Horror and his daughter Eve in Pacific City, a fictional California town that was the center of the weirdest paranormal activity one could imagine or even beyond what one could imagine. Doc Horror led what was essentially his own “family,” a group of social outcasts, weird folks, mutants, ghosts, and monster people. There was the ghost woman, Polychrome; the amphibious woman, Starfish; the pyrokinetic Firelion; the reptile man Komodo; the animal-human gangster, Raccoon; and Eve’s bodyguard, the undead gunslinger, Gunwitch. After a few more appearances (a short story serial in Dark Horse Presents and two three-issue miniseries), the Nocturnals have been quiet, as have their papa Dan Brereton as a comics creator. Now, Brereton brings his creepy comics creations back in the one-shot Nocturnals: Carnival of Beasts. Chronologically meant to fit between Black Planet and the three-issue miniseries, The Dark Forever (2001), Carnival of Beasts finds Doc Horror and company taking on a small group of evil scientists that have been turning children into monster kids – this while Doc Horror is taking Eve to her new boarding school, Nightshade School. Two short stories, one featuring Starfish and the other, Eve, round out this comic book. Brereton has always immersed Nocturnals in pulp storytelling and filled the pages of these comics with an eclectic mixture of moody atmosphere and colorful and fantastic creatures (think Clive Barker’s Nightbreed meets Scooby-Doo meets Universal Monsters meets Tim Burton’s stop-motion films). What makes the Nocturnals even more... delicious is Brereton’s painted artwork. Brereton is one of the few comic book painters whose painted artwork captures that unique feel of comics penciled, inked, and colored the old-fashioned way. Nocturnals: Carnival of Beasts is excellent material, but it’s also probably the least impressive in this small body of work. However, Carnival of Beasts is more imaginative and fun than 99 percent of the superhero comics being published by DC, Marvel, Image, or Dark Horse. Years ago, I had a short correspondence with Dan Brereton, and at one point he said that he had to put a lot of work into his comics for what seemed like little return. I’ll give my $6.99 and all my admiration to this exceptional artist and comic book creator, even if it doesn’t make up for his blood, sweat, and tears.